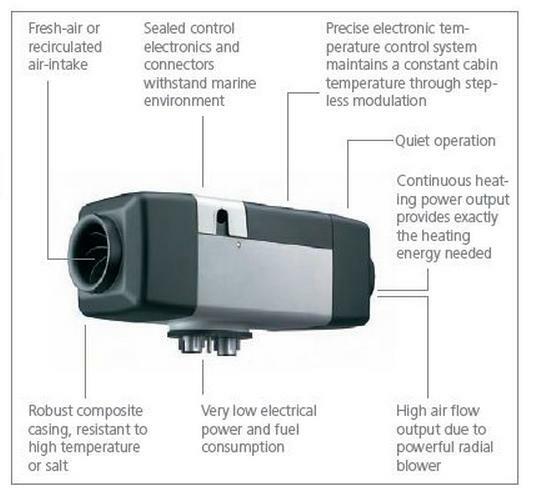 Learn more about Parking Heaters used in our vans. You will never feel cold inside our Campervans in the middle of a winter! Thanks to our customers we have decided to install the winter parking heaters in almost all of our Campervans. We have made the decision after the initial trials and really positive response from our customers. Now you can enjoy - as one of our recent customer said - "Toasty warm inside while outside it was snowing." Q. Does a Campervan with a Winter Parking Heater cost more money to rent? A. Yes. The winter heaters is an expensive additional equipment and it requires frequent maintenance and a separate battery to run. It is providing a comfortable temperature inside each van. The extra 5% charged to the rental price ( winter time only) partially helps us maintaining the heaters. Unfortunately it happens that some of them fail from time to time, and only specialised repair shops can fix them. If this happens during your rental, you will have to run the engine to keep warm and we will refund you the 5% of the extra price you paid. Of course, we will need to check first if the heater did not fail because of improper usage. Q. Can I use the Winter Parking Heater anywhere? 1,000m and should never be turned ON above 1,200 m.
Q. What fuel does the heater use and how much does it cost to run a heater all night? A. It runs on van's gasoline/ diesel, so there is no need to worry about extra LPG tanks. It burns 1-2 litres of fuel per night. Q. Will the heater keep us warm inside even in sub zero outside temperatures? A. Yes, It is thermostatically controlled and you can set your desired inside temperature. Of course there is a limit to approx. minus 10 degrees Celsius ( 14 degrees Fahrenheit). and we are not able to fix them remotely. Only specialised shops can fix the heaters. the engine heater to keep warm. Q. Can I use the heater outside the winter months ? the inside very quickly and turn itself "off and on" all the time and possibly fail. This will drain the Auxiliary battery and you will we awaken by the low voltage alarms. We cannot guarantee the heater will work well when it is too warm outside. and the auxiliary battery propellers the fan which uses very little power. The unit is electronically controlled and will never drain the battery completely. usually happens when you drive to your next destination.